That the New Arena is a great project and a prime piece of modern engineering is, today, common knowledge. That however didn’t stop a few enthusiastic Palmeiras supporters to come up with an interesting proposal of further improvements to WTorre – the constructor of the Arena – based on the concept of stehplatz, a German word which literally means “standing space”. Gabriel Manetta – a local businessman and the driving force behind the proposal – explained to the online journal iG that he spent a month doing research, gathering information and pictures. Together with friends Rubens Filho and Lucca Barbarisi he then prepared a presentation and, with the help of additional people within the club, was able to get Walter Torre Jr’s attention. Mr Torre saw the potential in the proposal and has already stated that he’s 99.99% convinced not only of the feasibility of it, but also that he intends to implement. So, what is this stehplatz all about? Nothing but a clever German invention: the installation of retractable seats. Instead of having the seats fixed directly to the cement, whole sections of seats can be fixed to railings, allowing for easy removal and assembly, thus creating standing space for supporters in the old-fashioned way . A stadium like Palmeiras’ New Arena – with a seating capacity of 45.000 – can increase the total number of supporters at any one event by as much as 7.000-10.000. 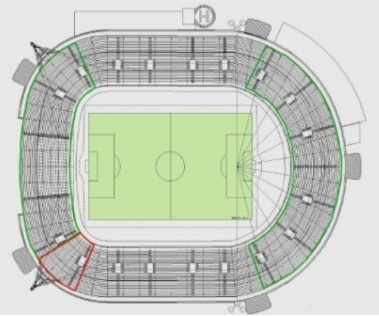 In the (clickable) picture to your right (courtesy of iG), the coloured areas indicate where the stehplatz system could be implemented: green for Palmeiras supporters and red for visiting supporters. You can also watch a short presentation of the mounting of seats at the Dallas Cowboys stadium – where the stehplatz technology was used – by clicking here. Walter Torre explains that the system couldn’t be used during FIFA events, as FIFA regulations state that every supporter shall have a seat. However, during national and regional games it can be used to its full advantage, attending the demands of organised supporter groups who much prefer a space where they can move around freely, chant and jump. In addition, it is ideal for other events such as concerts. Mr Torre estimates that implementing the system will cost an additional US$ 940.000. That means we’re looking at a 0.4% increase of the total budget in order to make room for a potential 15-22% increase in spectators. Easy math. Anything Palmeiras wishes to congratulate everyone involved in the process. This is a beautiful example of what can be achieved when everyone pulls in the same direction. Right, Mr Contursi? Previous Keep the course, Captain!